Melegoni made his first team debut for his current club Atalanta in 2016 and 2017/18 is likely to be his breakout season in Serie A.
Filippo is comfortable playing on the wing or in attacking central midfield role but also enjoys playing as a withdrawn playmaker behind the attacking front line. His impressive youth form has caught the eye. He has played for Italy's national side at every level up until under-19 and is sure to be in contention for full international honours once he starts to play at the highest level on a regular basis. Melegoni is a determined midfielder with plenty of stamina and likes to get back as well as forward. He makes for an essential player at the heart of any team's midfield and is likely to catch the eye of numerous Serie A top clubs. 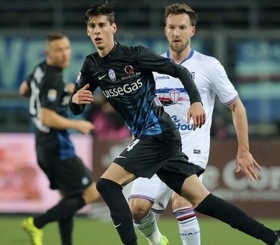 Juventus and AC Milan have both already sent scouts to watch Filippo in action for Atalanta's youth team. For the player it is a matter of time until he will likely be in demand and head for a stronger side than Atalanta. Melegoni has been compared to the Italian legend Andrea Pirlo in recent times and it is easy to understand why. An incredible ability to find the pass, great getting forward and strong from set pieces.